Rodent control is essential for homeowners due to the health, safety, and financial consequences they cause. Rodents are gnawing or nibbling mammals such as rats, deer mice, and squirrels. They can survive in almost any climate that we can because, like us, they are warm-blooded and can maintain a body temperature higher than their environment. Why is Ongoing Rodent Control Important? Rats and mice are known for their costly, destructive behavior. They chew through electrical wiring, creating a fire hazard. They chew through PVC and other piping, causing water leaks. They defecate everywhere, but most often in the insulation of attics and crawl spaces, which not only destroys energy-efficiency and pollutes the air quality inside your home, but attracts more rodents. They gnaw on wood and cardboard – rafters, furniture, boxes, and other personal belongings. Just a few rats or mice inside your home can multiply quickly into an infestation. This is a real threat that people often overlook. Bites, scratches, feces, urine, and contaminated food supply pose a very serious health hazard to humans and other animals. The CDC (Center for Disease Control) currently reports 11 diseases transmitted directly by rodents and another 15 transmitted indirectly. Breathing in the dust contaminated with rodent urine or feces. Direct contact with rat droppings through your skin or mucous membranes. Bite or scratch wounds or even contact with a dead rodent. Eating food or drinking water that is contaminated by rat feces. You can also get seriously ill from the bites of ticks, mosquitoes, fleas, or mites who have come in contact with rodents or their feces. 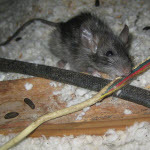 Rodents commonly infest insulated attics, crawl spaces, garages, and basements. They move into our homes uninvited for shelter, warmth, and food. And they put you and your family at serious risk. How Serious is My Rodent Problem? You may notice a small burrowing entrance or experience a brief sighting with only a small mice or rat infestation. Take action to limit the damage and prevent a larger blight. If you have a moderate infestation, you’ll notice rat droppings, gnaw marks, and nighttime activity. Even though rats are generally nocturnal, with a substantial population, you may see more daytime activity. Croach® implements some unique approaches to rodent control, using effective methods of inspection, extermination, and exclusion to remove these damaging pests from your property and to prevent them from coming back. We believe that the best form of rodent control is prevention. Rats and mice only need an opening of 1/4 inch to gain access to your home. Therefore, Croach® focuses on rodent-proofing exclusion as well as customized rat control, mouse control, baiting and trapping. Unlike many insect pests, rodents have a higher level of intelligence and wariness that makes them difficult to eliminate. Our Croach® technicians have years of experience as well as the products and tools to create an efficient, tailored solution to your rodent control problems. Step 1: Inspection. Call our office for a free phone consultation or schedule a free inspection online. Step 2: Trapping. Your technician will perform a thorough inspection and damage assessment to provide an accurate estimate for treatment and repair. It is crucial to employ trapping methods at this point to eliminate existing rodents. Step 3: Exclusion. Removing a current infestation of rodents isn’t enough. They’ll just keep coming back. Another vital aspect of rodent control is to block their access to your home. Exclusion is a skilled process of locating and closing off or sealing minuscule points of entry. Step 4: Restoration and Sanitization. Included in your initial inspection is a careful analysis of your attic, crawl space, or both. In some cases, it is necessary to replace the attic insulation, crawl space insulation and vapor barrier. We are pleased to provide professional insulation installation for Seattle area customers. 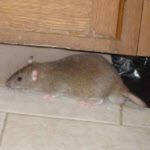 Rodent droppings, urine, carcasses, wood rot, and other contaminants can cause considerable structural damage underneath the home and pose a serious health hazard to you and your family. 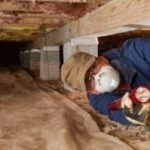 In heating-dominated climates, 40% or more of the air you breathe in your home originates from your crawl space – where mold, pests, and rodents reside. 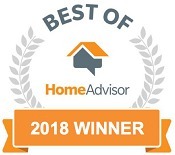 For this reason, our attic and crawl space insulation services include sanitizing and bacteria-killing odor control as part of the restoration. Step 5: Prevention. The best form of rodent control is prevention. Croach® maintenance plans are custom-designed to prevent a re-infestation of the home. One way we achieve this is by monitoring rodent bait stations around the exterior perimeter of the home. Trapping can be effective if there are only a few rodents present in the home. However, if a rodent witnesses another rodent getting caught in a snap-trap, for instance, they will avoid traps no matter the bait. This condition is called “bait shyness.” Croach® uses specialized traps and trapping methods, such as bait that takes up to five days to kill a rodent, so that rodent control is successful in the trapping phase. Croach® rodent control technicians use tamper-resistant bait stations to provide a safeguard for people, pets, and other animals. If you have a rodent problem in your home, you’re probably dealing with other pests such as moles, stinging insects, or spiders as well. You are going to love the protection, health benefits, and peace of mind that comes with Croach® progressive pest and rodent control services. Find a location near you to schedule your free rodent control inspection.